Some may argue that its financial downfall at the box office dooms the film as a failure — yet many critics deem Blade Runner 2049 the best film of the year. There is a strange dichotomy in thought here, as to what deems a film’s success: on one hand we have financial failure, perhaps not enough popcorn to draw in the casual fan; on the other, we have a resounding success as one of the best science fiction films of all time, thanks to the very thing that made it unfriendly toward the casual viewer: existential investigation. In that case, Blade Runner 2049 succeeds. It is long. It is hard to digest. But, to that end, it takes the viewer on a philosophical exploration of the human soul. That exploration, hard though it may be, is all the more important in an age when we are inundated with mindless entertainment, instant gratification, and unreliable information (I write, as I sit in a café staring at a couple in conversation — the girl, uninterested, browsing through Instagram; the guy, attentive, stares in erudite longing at her “uh huh” responses). Good science fiction asks questions — it becomes elevated. Makes us necessarily uncomfortable. Evokes self-analysis and growth. Creates a hypothesis — the driving force of science, philosophy, and technology. Breadcrumbs from the imagination to reality. These questions drive the purpose of a strong narrative, fictional or not. In a time of instant gratification, when we have egregiously stopped asking difficult questions ourselves, it becomes imperative that stories continue to do so. In short, questions matter. Art asking questions matters. The questions raised by Blade Runner 2049… matter. In this sense, it falls under the category of elevated science fiction. The kind of sci-fi that predicts and inspires our future. That begs for questions about humanity, and how we will adapt to our rapidly changing world. Huxley did this in his title Brave New World. What would happen if we could control human emotion? What, then, defines humanity? Blade Runner 2049 does this through its 163 post-apocalyptic mesmerizing minutes by starting with a question the original asked: what does it mean to be human? Are we programmed (by, perhaps, society)–and if we are, how can we break that and become an individual? In the first Blade Runner, the relationship of Deckard and Rachael blends the lines of human and AI together, for what are love and sacrifice if not defining traits of a human soul? In Deckard’s eyes, Rachael was as real as any other human. These lines are so blurred, in fact, that we are left questioning whether Deckard is a replicant at the end. This is also seen in the replicant Roy, who in his dying breathe proves to Deckard that he has lived and appreciated his life more than any human when he states: “I’ve seen things you people wouldn’t believe. Attack ships on fire off the shoulder of Orion. I watched C-beams glitter in the dark near the Tannhäuser Gate. All those moments will be lost in time, like tears in rain. Time to die.” Roy, thus, has transcended his replicant programming. He is not a glitch in the system. He is aware of the value of life, and thus saves Deckard in return. He notices experience—perhaps more so than humans do—and, as humans do, wants those memories to live on in some way. His life and memories not in vain. Much of the theme of Blade Runner 2049 seems the be focused on a character’s ability to surpass their “programming.” To become unique, in their eyes, is to become human — to become real. We can see this in Officer K’s desperate longing to be the human-hybrid. Once he discovers the possibility of his identity, he gains a new purpose. He is real. His memories, he thinks, are real. His existence is therefore relevant. When he is told that he is the replicant double of the hybrid, he falls apart. His memories a lie. His life unchanged. In a heartbreaking moment, Ryan Gosling’s brilliant acting shows just how K feels when he discovers that he is replicant. K’s initial idealism toward his false identity is catalyzed by Joi, his AI lover. Joi, herself, is on a similar journey. Desperate for self-actualization but controlled by her programming, she tries everything to please K. She hires a prostitute to give K the physical connection the two are unable to have. She sacrifices herself in attempt to admit love. Yet, in the end, she fails. While K wants to believe that she loves him—and wants deeply to be in love with her himself, he learns she was not unique after all. When the hologram of the Joi product kneels and tells K that “[he] looks like a good Joe,” everything comes full circle. His own Joi named him Joe. And in the simple statement K realizes that, just as his memories, the actions of his Joi model and all her affection towards him were planted within her, not created by her. Both programmed. Both serving a purpose not of their own fruition. However, just as Roy struggled with his identity in the first film, K is still able to break from his programming, largely due to his death. His pivitol moment occurs when the mass market Joi turns her back to him and walks away. At that point, he is dealing with the fact that he is not human at all, and that his affection toward his lover was in vain. This is his climax. He then makes a decision that embodies a highly human choice. Even though the entire concept of his identity is shattered, even though the very entity that affected his programming [the Resistance] commanded him not to, he makes a choice for himself. He saves Deckard and sacrifices himself. He lives a purpose outside of his programming by unifying a father and daughter and dies with a sort of self-possession. As his body lies in the snow, a smirk crosses his face — no longer Joe, but something that he wanted to be. Something real. Even though replicants do not yet exist in our world, the questions and world of Blade Runner 2049 hit close to home. A mirror held up to the darker sides of human nature. In the end, we all fall into a sort of programming. We fall into trends. We seek to be like others. We judge others for not following norms. Prejudice. Racism. Sexism. These things are still commonplace. We constantly want to categorize, because categories make things easier to understand. But in doing these things we also lose authenticity. As a result, much of the struggle we have in life is finding a place in it. We want to be real. Want to be noticed. Want to be loved. To impact. And in that struggle, or programming versus the self, maybe we aren’t that different from replicants after all. Maybe what makes us human, or different, is the journey in discovering our own humanity. 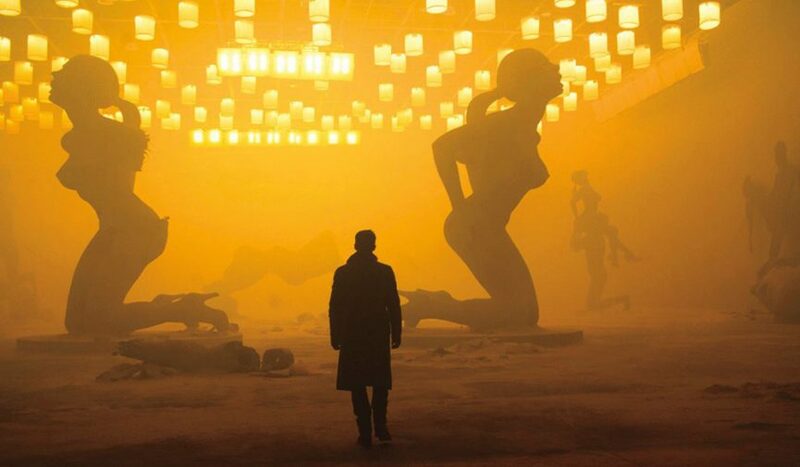 While Blade Runner 2049 provides no clear answers to these questions, it does a fantastic job exploring their possibilities, and to that end, is a tremendous success. We need stories to keep holding up that mirror, least we become the replicants ourselves.